We explain what division facts are, how they are taught in primary school, and share some fun games that you can try at home to make this knowledge stick. When teachers talk about division facts, they mean the division number sentences related to times tables. Therefore: 30 ÷ 3 = 10, 27 ÷ 3 = 9 and 24 ÷ 3 = 8 are all division facts for the three times table. How and when do children learn division facts? In Year 1, children learn to count in 2s, 5s and 10s. Their first introduction to division will be sharing groups of objects into equal groups of 2, 5 or 10 (although the word 'division' and the division symbol will most likely not be mentioned at this point). 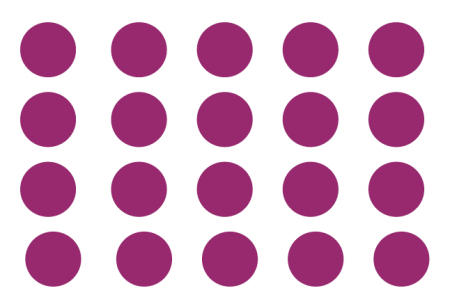 Teachers would use this diagram to explain that there are 4 lots of 5 dots, or 4 x 5. This is the same as saying there are 20 dots that can be divided into 4 groups of 5 (they could circle each row of 5 to demonstrate this). Once children have understood the inverse, they need to move onto learning their division facts for the 2, 5 and 10 times table. By the end of Year 2, they should have quick recall of the answers to questions such as 15 ÷ 5, 12 ÷ 2 and 70 ÷ 10. The more adept children are at knowing their times tables and related division facts, the easier subsequent learning in multiplication and division will be. In Year 3, children need to learn their 3, 4 and 8 times tables and corresponding division facts. It is possible that some children in Year 3 still do not understand the concept of the inverse, so it is worth reinforcing this concept again. By the end of Year 4, children need to know all of their times tables up to 12 x 12, and the corresponding division facts. This means that they should enter Year 5 knowing all their times tables, ready for more challenging work, multiplying larger numbers. Division bingo – Children have to draw a grid of nine squares. The teacher will ask them to write any numbers between 1 and 12 in the grid, making sure that they don't repeat any numbers. The teacher will then ask them division questions relating to the times table they are learning at the time, for example, if they are learning the 3 x table they may ask: 'I have 9 beads which I need to divide equally into 3 bags. How many beads will be in each bag?' or: 'What is 15 ÷ 3?' Children need to work out the answers and then cross off that number if they have it in their grid. The first child to cross off all their numbers is the winner. They need to look at each of the numbers in the top row and then divide each one by 4, putting the answer in the box below it. The idea is that the teacher sets a timer (ideally a visual one on the interactive whiteboard that everyone can see). When a child has finished their grid, they write down their time. They then need to repeat this activity, seeing if they are beating their own time on each go. Jumbled number sentences – Children need to be given 12 strips of card. They need to write each division fact out for the times table they are learning, so if they are learning the 6x table, they need to write out: 6 ÷ 6 = 1, 12 ÷ 6 = 2, 18 ÷ 6 = 3 etc. (It may be easier to get them to write out their 6x table and then convert this to division facts.) Ask your child to cut up the strips so that they have the questions and answers on separate cards. Jumble up all the cards and then time your child matching them up again.